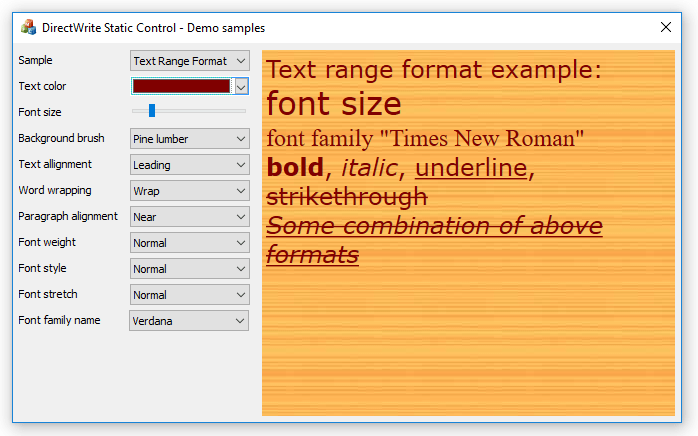 While doing some refactoring on sample source code presented in MFC Support for DirectWrite series, I had the idea to make a control easy to be used for rendering text. It could be a custom MFC control derived from generic CWnd class or an ActiveX but finally I chose to derive from CStatic, just for simplicity. handles AFX_WM_DRAW2D and AFX_WM_RECREATED2DRESOURCES registered messages, which are sent by the MFC framework to a window with Direct2D MFC support enabled. Implementation details can be found in the demo application, attached here for download. So far, it doesn’t yet implement inline images, typography and effects but these will be done in a future version along with other Direct2D/DirectWrite features. This entry was posted in Direct2D, DirectWrite, MFC and tagged Direct2D, DirectWrite, mfc on 2016.02.14 by Ovidiu Cucu.